Added on 04 February 2019 . By Victoria Brzezinski. "You’ll never grow old, Michael. And you’ll never die. But you must feed”. 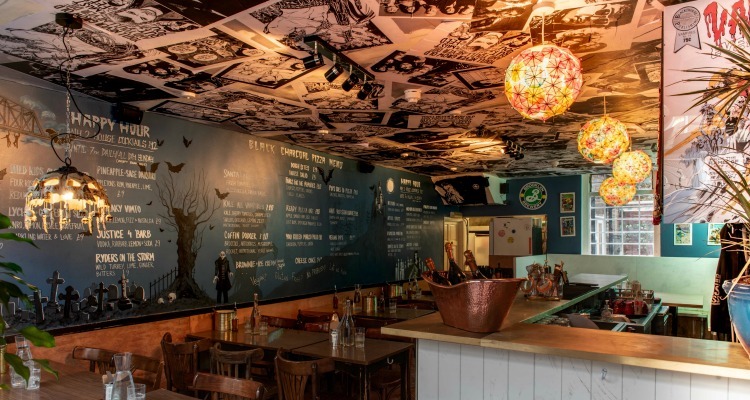 And feed you will, at the second incarnation of in Camden, a vampire-themed pizza joint based on the cult classic. Bone chandeliers and comic book strips keep the vampire theme running throughout. The playlist keeps things delightfully Eighties all night long: shout out to baby Vanessa Paradis’ seminal Joe Le Taxi, a personal favourite. Continue riding the wave of nostalgia with pun-heavy cocktails like the Sneaky Vimto (cassis, lemon, fizz) and Justice For Barb (a vodka-rhubarb number), both £9 and both yum. The all-black pizza crust is Lost Boys’ USP, made extra moody with the addition of vegetable charcoal, which apparently works to minimise bloating and maximise pizza-eating ability, according to our extremely lovely waitress. 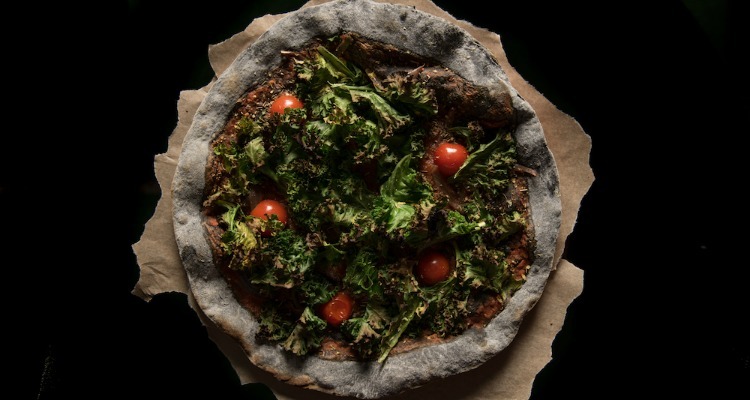 Pizza-wise, we tried out Lost Boys’ vegan smash-hit, 'Kale All Vampires' (£10), which is topped with charred kale, cherry tomatoes, caramelised shallots, lemon zest, oregano and nutritional yeast. Additional regular cheese is available if you’re feeling it. We were. We liked it, but it had nothing on the special, dubbed the 'G.O.A.T. ', a.k.a. eighth studio album by LL Cool J, and also a “heinously cheesy” medley of spinach, goats cheese, toasted pine nuts and a balsamic pentagram (£12). Kall All Vampires is a vegan-friendly option loaded with greens. Once fed and watered, you’re advised to saunter down to Croque Monsieur – a basement bar adorned with absinthe fountains on every table. The waitress will talk you into trying one of the semi-ridiculous “inhibition hats which help guests magically lose theirs” to get you into the mood to try some of the Green Fairy herself – whether diluted with water, 19th century-style, or in a more approachable cocktail. For those shy of absinthe, it helps when the flavour profile is artfully described as “dulcet notes of white chocolate” instead some kind of a 70 per cent ABV nightmare. Lost Boys is exactly what you’d hope for in a vampire-themed throwback pizzeria: a bit geeky and silly, but if you like a bit of cheese, it’ll be love at first bite. Ehhh.